ABB Grifols Trickett: Central Piedmont Community College and President Tony Zeiss have brought together the leadership of the energy companies in the Charlotte region to discuss the skill sets and talents needed in the workforce. The forum allows companies in the energy cluster to combine needs and allows the college to take them and put together a program that benefts us all. mistakes there before coming to our production area. We have 24-hour operations so classes are scheduled when our employees are available. Patton: It���s a similar success story for us with the people at Lenoir Community College in Kinston. They created the Aerospace Manufacturing Readiness Program for us. It���s part classroom instruction and part lab, which is critical because it allows students to learn our manufacturing process and how to work for us. The program expedites building our workforce because we can hire from a pool of students who successfully completed the program. Crisco: The customized training that the community-college system offers is one of the biggest things that separate us from other states. If I were living in Massachusetts, I might say Harvard is pretty good, but there isn���t the quality of community colleges that we have here. We have 17 institutions in the university system, 58 community colleges and 36 private universities, including Wake Forest University in Winston-Salem and Duke University in Durham. When you���re in advanced manufacturing, it���s critical that you have access to that kind of training. Top, 30 years later, Grifols Inc. is still benefting from the state���s economic-development help. Above, ABB High Voltage Cables North America fnds it easy to recruit employees to North Carolina. 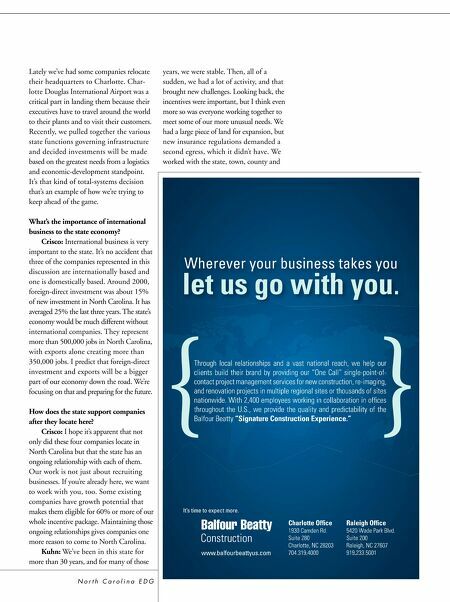 16 North Carolina Economic Development Guide What advantages does North Carolina have in terms of infrastructure? Patton: We were looking at several dozen sites initially ��� both domestic and international. One of the key things we looked for was infrastructure, especially what is available that supports our logistics. We quickly narrowed the search to North Carolina because of the Global TransPark. It has an 11,500-foot runway, access to highways, two deep-water ports nearby and rail coming to the site by the end of 2012. There we have access to any mode of transportation we need or want for our products or our imports. It helps us expedite our deliveries and work effciently, which helps our bottom line. Maintaining those costs at a good rate can help us win new business, which creates more jobs. Kuhn: One of the state���s strengths is looking forward and understanding what advanced-manufacturing companies will need. At a forum, we talked with the governor about our future needs, especially water and waste treatment. Biotech companies use large amounts of water. Right now we use more than 500,000 gallons each day, and that amount is only going to increase in the future. We don���t want to compete with other companies for the resources we need to grow. If we���re going to attract these types of industries, we need to plan for their needs. Trickett: I���ll add the access to international destinations from the airports in the state. Our customers enjoy visiting the factory and having the ability to do that in an easy fashion is key for them. Crisco: You will not attract global companies without international airports.